In the absence of ligand, the AR exists in an inactive complex with molecular chaperones (Hsp90, Hsp70, Hsp56 and immunophilins). These proteins help in maintaining the correct conformation of the receptor necessary for efficient ligand binding (Pratt and Toft 1997). Schematic diagram of the Hsp70 showing the NH2-terminal ATPase domain of the protein and the COOH-terminal substrate binding domain (SBD) responsible for interaction with unfolded proteins. Co-chaperones Hsp40, Hip and BAG-1 interact with the ATPase domain of Hsp70. Hop binds to the COOH-terminus of Hsp70 and serves as a bridging factor for interaction with Hsp90. The minimal assembly of molecular chaperones necessary for efficient folding of nuclear receptors are Hsp90, Hsp70, p23 and co-chaperones Hsp40 and Hop (Dittmar et al. 1998; Kosano et al. 1998). Hsp70 is thought to be the first to bind the receptor (Morishima etal. 2000) and its function is positively regulated by the co-chaperones Hsp40 (Dittmar etal. 1998). Hop, binds to both Hsp90 and Hsp70 and functions as an adaptor protein, which brings a dimer of Hsp90 to the complex (Dittmar and Pratt 1997; Chen and Smith, 1998; Johnson etal. 1998). The function of p23 stays unclear, though this chaperone has been shown to be important for hormone binding by the glucocorticoid and progesterone receptors, where p23 stabilizes the aporeceptor complex at a late step of the receptor folding (Dittmar and Pratt 1997; Kosano etal. 1998). The chaperone activity of Hsp70 is regulated by two other co-chaperones Hip and Bag-1 (Fig. 2.3). Hip (Hohfeld etal. 1995) positively regulates Hsp70 function, while Bag-1 competes with Hip for binding to Hsp70 ATPase domain and is a negative regulator of Hsp70 (Hohfeld and Jentsch, 1997; Takayama et al. 1997; Bimston et al. 1998). 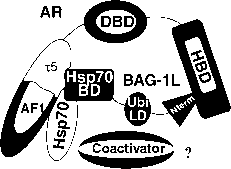 In addition Bag-1 indirectly interferes with the binding of Hop to Hsp70 (Gebauer etal. 1998). Bag-1, therefore, together with other chaperones and co-chaperones maybe involved at different steps of protein folding. Bag-1 is a family of proteins encoded by the same mRNA through the use of alternative translation-initiation sites. The largest isoform (Bag-1L) is translated from a noncanonical CUG codon followed by an in-frame downstream AUG start sites giving rise to Bag-1M, Bag-1S and p29 (Takayama etal. 1998; Yang etal. 1998). Bag-1L contains an NLS that allows this protein to be localized in the nucleus while the other Bag-1 proteins are mainly cytoplasmic. Indicated are the domains of the AR consisting of the NH2-terminal transactivation function AF1, the DNA binding domain (DBD) and the hormone binding domain (HBD). The site for the transactivation function t5 is depicted in AF1. Presented in the figure are the interactions of the NH2 and COOH-terminal domains of Bag-1L with the HBD of the AR and the ATPase domain of Hsp70 as well as the t5 of the AR. This complex is required for the recruitment of coactivators but the exact binding sites of these molecules to the complex have not been determined. 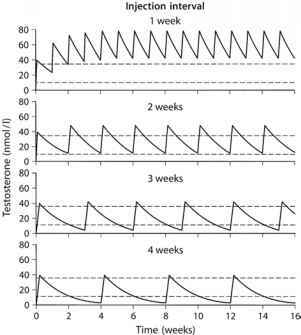 this chaperone (Bimston et al. 1998; Höhfeld and Jentsch 1997; Takayama et al. 1997). Bag-1L enhances the transactivation function of the AR (Froesch etal. 1998). It does so by using its Hsp70 binding domain to interact with the t 5 domain at the NH2-terminus of the AR. In addition it interacts with the HBD of the AR through its N-terminal sequence (Shatkina etal. 2003). Thus it may function as a bridging factor to bring the NH2- and COOH-terminal regions of the receptor together (Fig. 2.4). The AR, Hsp70 and Bag-1L are recruited to the androgen response element on the prostate specific antigen (PSA) gene (Shatkina etal. 2003). However, the molecular details as to how Hsp70 and Bag-1L enhance the transactivation function of the AR are still under investigation. In addition to Bag-1L, the molecular chaperone Cdc37 specifically interacts with the HBD of the AR and plays a role in the transactivation function of the receptor in a manner that is not compatible with hormone binding. It appears that it functions at a late stage in receptor activation and may be related to the conversion of the ligand bound but inactive receptor into an active state but its exact mode of action is not clear. (Fliss etal. 1997; Rao etal. 2001).